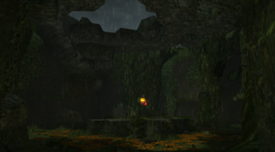 The Arbor Chamber is a small cave in the Tallon Overworld. Samus can only get here once she has obtained the Grapple Beam and the Plasma Beam. The Arbor Chamber houses a Missile Expansion resting on a stump in the center of the room. The walls and floor are covered with vegetation, and the latter is carpeted by tiny orange fungi. The only exit is a Blue Door that leads to the Root Cave. This page was last edited on 18 July 2013, at 03:59.